Thanks! I’m toying in going back to the four-panel grid/pacing for the next long storyline… but then a page like this comes along that makes me think I should stick to the full page layout I’ve been using for this adventure. Do you have a preference, readers? What about if returning to the four-panel style meant I could post episodes for you twice a week? 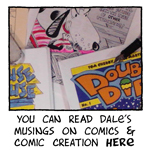 I say follow your muse, Dale! Choose whatever format that works best for you and your story! i agree with tom…the layout looks awesome. it is super fun to read! kudos! !